The Washington Redskins moved to 3-2 on the season after beating the Baltimore Ravens 16-10, thanks in part to the NFL rule book. 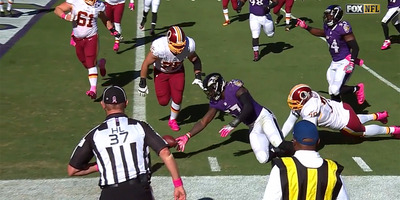 In the third quarter, leading the Ravens 13-10, the Redskins snapped the ball from their own three-yard line. Kirk Cousins dropped back into Washington’s own end zone and attempted a pass for a first down that was picked off by Ravens linebacker C.J. Mosley. Mosley took the ball and began running for the end zone. As he got closer, he reached the ball out for the touchdown, lost control, fumbled it, and the ball rolled into the end zone. Because the ball rolled through the end zone as a fumble, it was ruled a touchback. Washington reclaimed possession, this time on first-and-10 on their own 20-yard line. A bad play by Mosley, to be sure, but it’s a controversial rule that some in the NFL world have a problem with. Normally, a fumble out of bounds means the team retains possession and the ball is placed where it went out of bounds. Instead, Mosley’s good defensive play turned into a gain for Washington — they moved up 17 yards, from their own three to the 20. On the ensuing drive, they kicked a field goal to take a 16-10 lead, and neither team scored again. This wasn’t the game-deciding play, but it was a game-changing play. The Ravens had a chance to go up 16-13. Instead, their offence couldn’t get going in the fourth quarter, and they fell to 3-2 on the season in the competitive AFC North.